It’s clear that Toronto is changing; it’s not so clear that our political leaders have noticed. The debate about the revitalization of Yonge St. in North York Centre, where the cityscape is now dominated by residential towers, highlights the problem. ‘RE-imagining Yonge’, a city initiative covering the area between Sheppard and Finch Avenues, goes to City Council for a final vote on March 26. The initiative would improve Yonge St. by widening sidewalks, adding safe road crossings, installing a bike lane, and providing benches and green space. A key to the proposed changes is the narrowing of Yonge from six to four motor traffic lanes. This change is opposed by Mayor John Tory even though the project is consistent with Toronto’s Vision Zero Road Safety Plan and a fitting response to the high number of pedestrian deaths that Tory himself has called a crisis. Many city politicians continue to think of Yonge as a highway despite the obvious conflict with the use and enjoyment of the street by local residents and visitors. At a recent public hearing, one resident described Yonge as a “canyon” his elderly father was afraid to cross. A pleasant streetscape would also attract visitors from around the city to the benefit of local retail, dining, and arts venues, fulfilling one of the original goals of North York Centre as a ‘downtown’ in the suburbs. 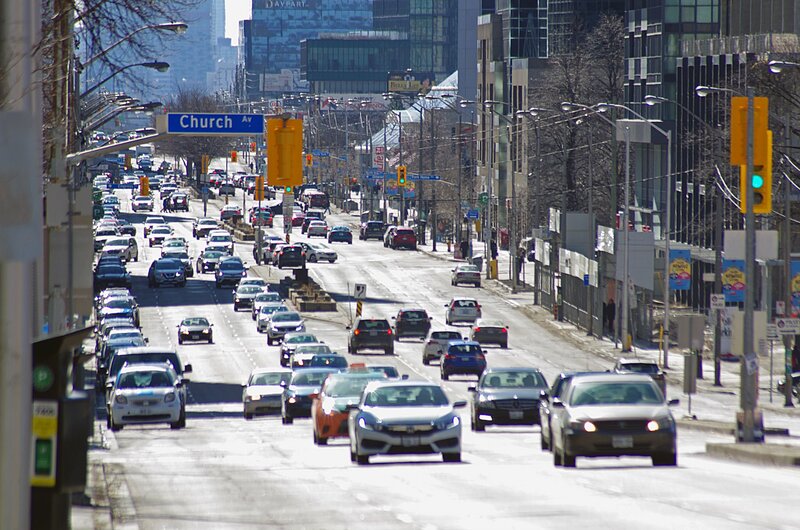 Motorists passing through the area — most of them from outside the city and sitting alone in cars — wouldn’t be denied their use of Yonge as a thoroughfare or even face significant delays; they would simply be asked to make do with four lanes. In fact, North York’s intentionally overbuilt road system allows motorists to bypass Yonge altogether. Motorists who are sympathetic to the safety objectives of the revitalization initiative could play their part by ride-sharing, taking transit, or avoiding rush hour. Cyclists prefer Yonge for the same reasons as motorists: it’s direct, convenient, and provides access to attractive retail, entertainment and public venues. By contrast, Beecroft Rd. would give cyclists a safe route to a cemetery and a lawn bowling field, but virtually no other commercial destinations. Putting bike lanes where they’re convenient for motorists instead of cyclists has predictable consequences. In the late 1970s, the city rejected a bikeway on Bloor despite the street’s popularity and convenience for cyclists. Instead, a bikeway was installed on parallel Harbord St. By October 1983, the city’s Works Commissioner, Ray Bremner reported that cyclists still preferred Bloor, where cycling volumes had also increased. Almost 40 years later, Bloor finally got a bike lane – albeit too late for cyclists killed or seriously injured on Bloor in the intervening years. We know that motorists’ appetite for public space isn’t likely to ever be satisfied. Various road widenings and the TTC’s subway extension to Finch by 1974, which put transit vehicles underground, haven’t relieved road congestion on Yonge. As a city, we should stop acting like we owe every solo motorist who wants to drive in Toronto the public space to do so even when it’s at the expense of the safety, well-being, and vibrancy of our neighbourhoods. Public road space is one of our city’s most valuable assets. As population densities increase, the unbridled dedication of that space to the exclusive use of motorists is inconsistent with other city-building objectives. It’s time to re-imagine Yonge St. by recognizing that our city is changing – indeed, it’s already changed. Albert Koehl is an environmental lawyer and the author of the online guide Road Follies. He sat on the Coroner’s expert panel on road safety in 2012.